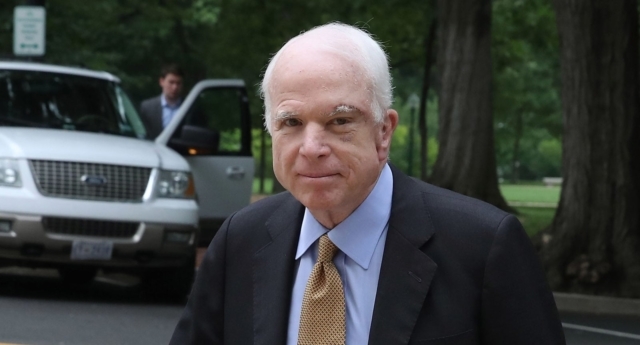 John McCain, the Vietnam war veteran, senator and presidential candidate, has died aged 81. He had been diagnosed with an aggressive brain tumour in July 2017 and had been undergoing treatment. McCain’s family announced he had decided to cease treatment on Friday and he died on Saturday in Arizona, his office said. “Senator John Sidney McCain III died at 4:28pm on August 25, 2018. With the senator when he passed were his wife Cindy and their family,” his office said in a statement. The senator, a celebrated war hero, has been noted as a strong LGBT+ ally in recent years, although this has not always been the case. He was a supporter of Don’t Ask, Don’t Tell, which forced soldiers to hide their sexual identity, and called the vote to allow gay people to serve openly in the US military a “sad day” in 2010. Last year, however, McCain came out in opposition to President Donald Trump’s proposed transgender military ban. “Any member of the military who meets the medical and readiness standards should be allowed to serve — including those who are transgender,” Mr McCain said in a statement. In 2015, McCain, made headlines when he threw his support behind Barack Obama’s nomination of Eric Fanning, who is openly gay, to be the Secretary of the Army.